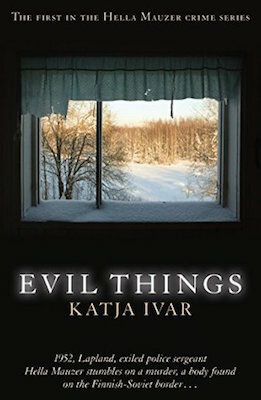 The following is an exclusive excerpt from Evil Things, Katja Ivar’s chilling Cold War thriller set in 1952 Finland, in which Hella Mauzer, one of the country’s first female detectives, pursues a murder on the Soviet border. Once again, Irja was telling the little boy who crouched motionless next to the stove that he shouldn’t worry, that his grandpa would be back soon, any time now, really. Over the last four days, she’d kept repeating it like a mantra: don’t worry, Kalle, he went to the city, you know how it is, it takes time, and maybe he’s been hunting along the way, or else he’s bringing you something special. Kalle smiled absent-mindedly and nodded, but he clearly didn’t believe her, and she couldn’t blame him for that. What she was saying was a lie. The boy knew it, and she knew it, and all the curious villagers who stopped by her house to inquire about the boy knew it too. Old Erno was not coming back. Irja looked at the boy, frowning. He hadn’t said a word since he’d first arrived at her house earlier that week, brought in by a sour-looking old woman who lived in a crooked little log cabin on the outskirts of the village. Irja barely knew her. Still, the woman had come in without knocking, without even taking her shoes off. She had walked over to the kitchen table, stubbornly dragging the little boy behind her, and had seated herself on the bench. The boy had sat down as well, but he hadn’t looked up at Irja nor had he answered her greetings. Martta, that awful woman, had looked at Irja in defiance. The boy had shaken his head without looking at her. She didn’t dare ask Martta outright if Erno was dead. Irja had stared at the woman, appalled. What kind of person was she? Still, she had probably saved the child’s life. Kalle and his grandfather kept to themselves, barely venturing into the village. Apart from Timo, no one ever saw them, and even Timo didn’t see them often. Weeks could have passed without anyone knowing that the old man had disappeared. Weeks could have passed without anyone knowing that the old man had disappeared. “Do you know where Erno went?” Irja asked the woman. She remembered stories about her. Martta was a relation of the old man, but they were not close. And there were rumours of a conflict, of an old dispute, which, left unresolved, had grown out of proportion and dragged on for decades. The old woman had got to her feet, straightening her grey wool skirt, tugging at her sleeves. She had barely looked at the boy, who sat like a little wooden statue, his back straight, his hands folded demurely in his lap. Only his nose, which was wet, was twitching like that of a little rabbit. Irja’s heart sank. Would she be able to take care of the child until the disappearance of old Erno had been cleared up? And what would happen next? His mother had died some months ago. Kalle didn’t have a father. Would social services take him? As if he was reading her thoughts, the little boy wriggled nervously on his bench, and a single tear ran down his dirt-smeared cheek. She had hugged the boy and held him close to her, whispering reassuring words into his ear. Her old grey cat, Seamus, had sauntered over to the boy and sniffed his hand. Seamus must have liked what he smelled because he had jumped onto the bench and settled next to the child. It was a good sign. Seamus was not the kind of cat to easily warm to strangers. If he took a liking to little Kalle, maybe it would help the boy recover. Animals are great for that sort of thing, soothing the wounded and the sad, comforting those who have lost their loved ones. After a while, the boy’s breathing slowed. He had fallen asleep. Irja had carried him to her own bed and covered him with a bright quilt, with Seamus at his side. Then, she had pulled a sheet of paper out of the desk drawer and had started to write her letter to the police. She had sent it the very same day, rather like a bottle that a prisoner on a desert island throws into the ocean, but she didn’t allow herself to think about that too much. Maybe in some places, in other countries, ordinary citizens could rely on the police to help them. Maybe. She was not so sure the same applied to the godforsaken strip of frozen land they called home. From EVIL THINGS. Used with the permission of the publisher, Bitter Lemon Press. 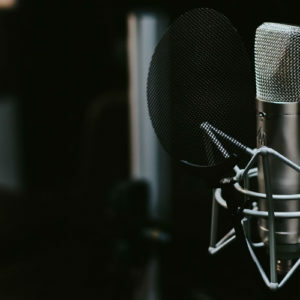 Copyright © 2019 by Katja Ivar.